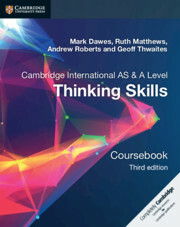 This series helps students and teachers following the Cambridge AS & A Level Thinking Skills syllabus (9694) for examination from 2020. Universities and employers have high expectations for 21st century learners. They want students who can think critically, collaborate efficiently and produce creative solutions to problems. With more practice questions than the previous edition, this coursebook provides opportunities for students to improve both their critical thinking and problem solving skills. It walks students through different scenarios – such as drawing conclusions from arguments – explaining the thinking process involved and helping to increase confidence when thinking independently. Suggested answers to the coursebook questions are in the teacher’s resource. Exam-style questions throughout the book give students opportunities to practise their skills and build confidence with Cambridge AS & A Level Thinking Skills. Published by the experts that brought you other skills-based syllabuses – Global Perspectives and English General Paper. Example activities with commentary show how to approach questions and help students to understand critical thinking and problem solving concepts. Two clear parts – critical thinking and problem solving – make it easy to co-teach. 1. What do we mean by a 'problem'?